The plaque provides the building’s construction date and the name of the original owner (if known), and is appropriate for display on both residential and commercial buildings. 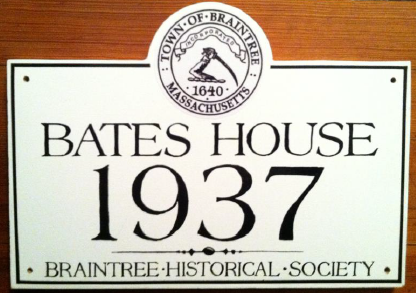 Information to appear on each plaque will be researched and/or verified by a member of the Braintree Historical Society. If the original owner of the property is not able to be verified, the date will be displayed on the plaque without the owner’s name. House plaques will not restrict homeowners from making changes to their property. The sign is decorative and informational only. The home or structure must be at least 50 years old. 10 inches high by 14 inches wide (for smaller homes). The plaque is a medium density overlay (MDO) weatherproof sign board, with a white background and black antique lettering. Holes are pre‐drilled and include stainless steel screws for mounting. The Historical Society asks that the plaque be attached to the front façade of the home or structure so it can be visible from the street. Braintree Historical Society, 31 Tenney road, Braintree MA 02184.